Anyhow, the actual universe is divided into two parts. First, there is the ‘observable’ universe, which spans approximately 93 billion light-years in diameter. Then we have the actual universe, which has no set diameter as there is still quite a big debate brewing in the scientific community concerning whether or not the universe is finite or infinite. We may never know, as we can only see light from distant objects that have had the time to travel from its original position to our own planet, which limits exactly how much we can see of the universe. One can argue that, based on its flat geometry, the universe continues infinitely in all directions, just as we are hindered by the sea’s horizon as we gaze out in all directions here on Earth. But either way, we know something more exists beyond our cosmic horizon, we are just unable to detect exactly what lies just beyond it. However gravity is a strange beast, albeit a useful one to us here on Earth because it provides certain clues to the existence of objects that are very small, difficult to spot, or perhaps even entirely invisible (like black holes). Rocky Earth-like exoplanets are a good example of gravity’s usefulness in astronomical observation. Most exoplanets we’ve discovered thus far were found through the radial velocity method, which observes tell-tell ‘wobbles’ that happen as a planet tugs on its parent star. It is through that same phenomena that we are able to determine there is more beyond the scope of what we can see… since gravity is still applicable on a large-scale in the universe, just as it is on a small-scale. NASA’s Wilkinson Microwave Anisotropy Probe’s (WMAP) spent an entire three years studying the universe’s cosmic microwave background radiation, which is the remnants from the radiation created only 380,000 years after the big bang. 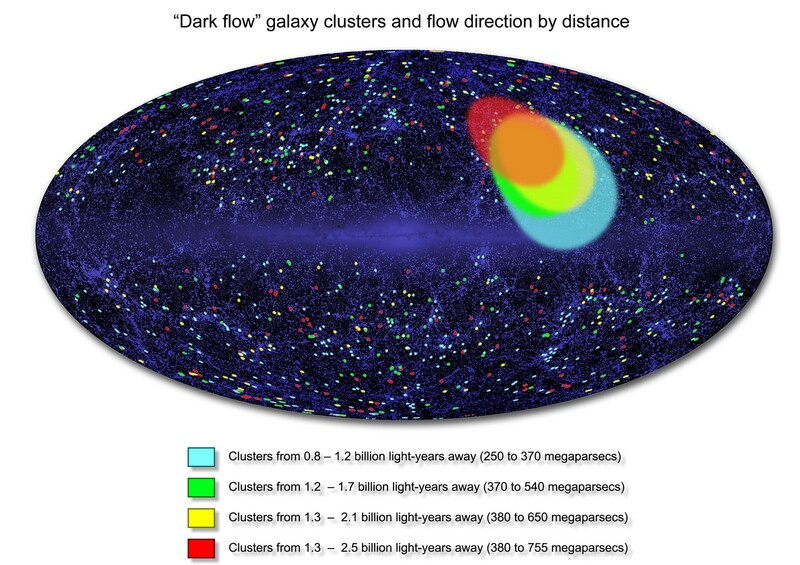 It also developed a catalog of deep space clusters, some of which are more than 3 billion light-years from Earth. When scouring through the data collected, the team spotted out more than one hundred galaxy clusters that are lit up by hot, x-ray emitting gases. Our theories on the CMB basically say that the waves that sprung from the big bang should pass through said galaxy clusters and change in predictable ways under certain scenarios, including if the galaxy is moving relative to the background glow. The WMAP was developed to test this, which is known as kinematic Sunyaev-Zel’dovich (SV) effect, but physicists found something else altogether that brought more questions to light than it answered. The clusters are traveling more than 2 million miles per hour, into an expanse of about 20-degrees of sky into a line from our solar system, to the constellations of Centaurus and Hydra. Furthermore, the trend is not a statistical fluke, as it continues to hold steady throughout interstellar space instead of bucking black to normal speeds and distributions. “It’s the same flow at a distance of a hundred million light-years as it is at 2.5 billion light-years and it points in the same direction and the same amplitude. It looks like the entire matter of the universe is moving from one direction to the next,” says Alexander Kashlinsky, the team leader of the study from NASA’s Goddard Space Flight Center in Greenbelt, Maryland. This baffling observation suggests that something created only a fraction of a second after the big bang (moments before inflation, when the universe began to expand outward at incredible speeds) is involved, exerting a gravitational force on the clusters from just beyond the scope of our observable universe, but what? “We can only say with certainty that somewhere very far away the world is very different than what we see locally. Whether it’s ‘another universe’ or a different fabric of space-time we don’t know,” Kashlinsky continued. One theory put forth about the observations fits theoretical models purported by string theory, of how a ‘sister’ or ‘twin’ universe may be pulling at our own, which would account for what we’re observing with the clusters traveling so quickly. Regardless, the structure is not thought to be a part of our own simply because we haven’t observed anything that could have an immeasurable mass to accomplish anything similar to what we’re observing here. It is possible though, that there is a yet-to-be-seen neighboring part of our universe that underwent inflation much differently than our section did. Interestingly, maybe the answer to this riddle could potentially overhaul our theories about dark matter and dark energy, perhaps? It’s hard to say, but it does present some interesting questions.